Do you need to get certified? Looking for a Pearson Vue testing center? The Institute for Corporate & Continuing Education testing services include: Pearson Vue technical and financial services exams and private test proctoring. Follow this link if you need to schedule a Pearson Vue exam. 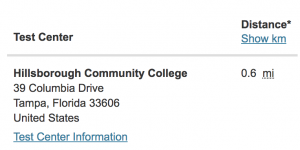 Should you wish to schedule the exam at our test center, please enter the zip code 33606 and look for Hillsborough Community College. If you are interested in having us proctor your exam, please complete the form below.